I want to share one final fabric manipulation with you that I've found very helpful in creating a highly textured quilt. It's the humble ruffle. But oh my...there are so many different variations on it! 1. Anchor your thread just next to one of the short edges of a strip of fabric. 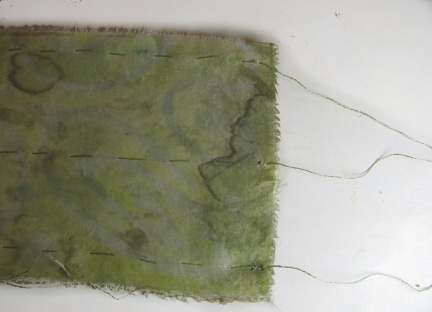 Do a loose running stitch along the length, and leave an unknotted tail at the other end. I did a selection of strips with one line of stitching right down the center, one on each edge, and one on each edge with a middle line like the one shown above. 2. Gather the piece of fabric by gently pulling on the loose thread ends. 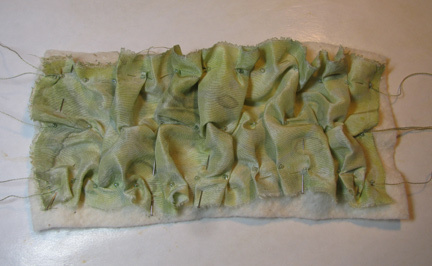 Work the fullness of the ruffle through the piece to get the amount of puckering that you desire. When you are satisfied, knot off the loose ends and trim the tails a bit. 3. 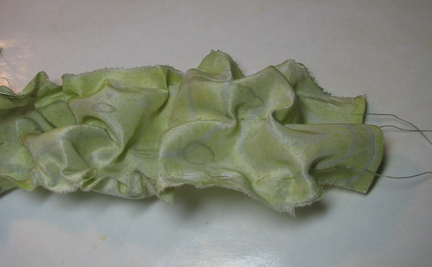 Pin the fabric to a thin piece of batting if desired. 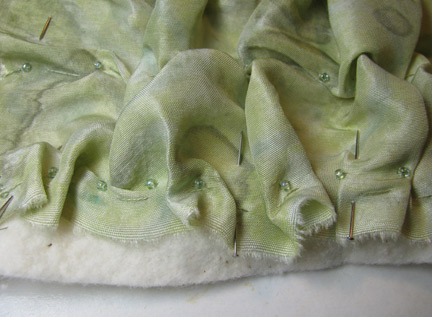 Stitch through all layers, adding beads to hold the ruffles in place. You can do this without the batting, but be careful to keep your thread tension very loose. 4. Trim the batting until it is just hidden by the edge of the fabric (not shown). 5. Arrange the manipulated pieces of fabric on top of another flat piece of fabric (or more than one piece, in whatever shapes you want). I painted a piece of batting and used blanket stitch to attach two flat rectangles of glue gel resist fabric. 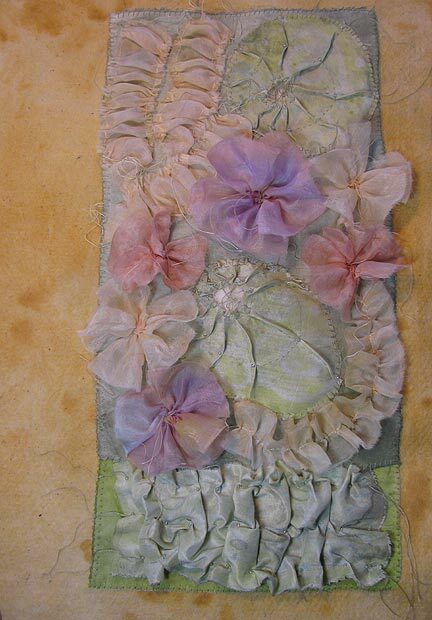 I added one additional style of manipulated fabric, some China silk flowers, which are strips that are gathered along one edge only. Instructions can be found on my Beading Arts blog. That is lovely, Cyndi. It's so soft and pretty and feminine. I love the muted pastels. Enjoyed the (three) posts on Manipulated fabrics! Well, I'm 'hooked' - there is much to see and read... you'll see me commenting here and there!